Robert Kilzer, Lemmon, South Dakota, was a volume buyer for these good bulls. 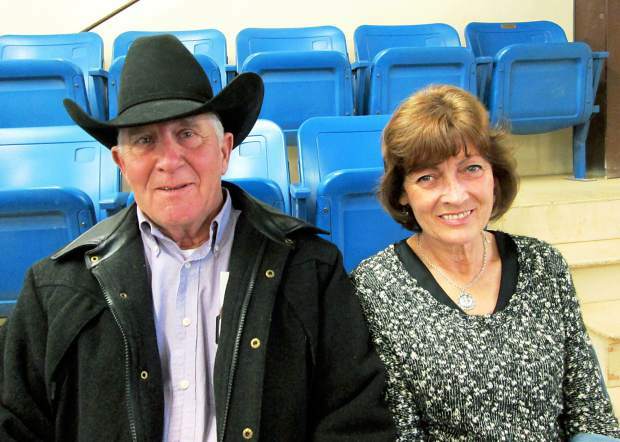 Dan and Cindi Conner, Belle Fourche, South Dakota. 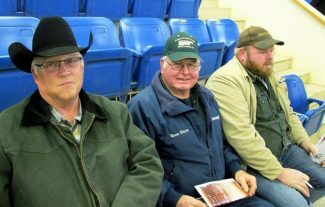 Dan Thompson, Buffalo, South Dakota, with Bob and Daron Tenold, Reva, South Dakota. With the cooperative weather, there was ample time for this good sized crowd to gather and walk through the pens, evaluating this offering of two-year-old bulls. Gregg and Mary Urlacher have molded their program into one that sells problem free-two-year-old bulls that have not been pampered. The ranch headquarters are near Regent, North Dakota. These bulls are presented in a modest condition. They have been fed in a manner to promote longevity. These are bulls that stay sound on their feet and legs. Many of the repeat buyers on the seats kept the sale moving as they quickly selected and bid on their top choices. Several half and three-quarter brothers were featured in this sale—made possibly through the extensive AI program used by the Urlachers. The bulls are guaranteed breeders, and Gregg keeps the bulls until May and then delivers them for free. Top selling bull of the day was Lot 7, selling for $9,000 to repeat buyer, Reuben Olson, Prairie City, South Dakota. This son of Sitz Upward 307R was out of a daughter of KMK Alliance 6595 187. He had an 83 pound birth weight and a weaning weight of 695 pounds With a 40.5 cm. scrotal measurement, he posted EPDs of BW 1.7, WW 54, YW 99, and MILK 25. Deran and Tina Lefor, Gladstone, North Dakota, were back again this year to purchase another top seller, Lot 5 at $8,750. 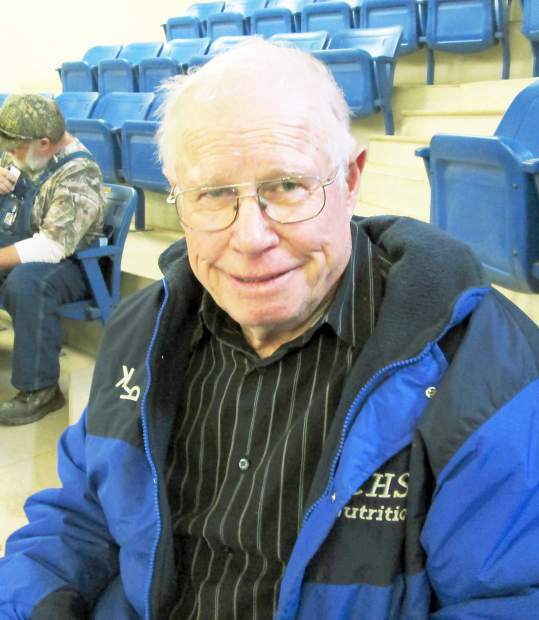 He was UA Power Tool 3363, a son of PA Power Tool 9108, and out of a daughter of Whitestone Widespread MB. With an 82 pound birth weight, he weaned at 685 pounds and had a yearling weight ratio of 106. His EPDs were BW 3.3, WW 56, YW 100, and MILK 34. At $7,500, Lot 32 was another purchase by Reuben Olson. Sired by Sitz Upward 307R, he was out of a daughter of NF Alliance 348-3. Born at 87 pounds, he weaned at 630 pounds He posted EPDs of BW 2.8, WW 60, YW 105, and MILK 32. Lot 1 brought $7,500 from Miller Ranch, Raleigh, North Dakota Here was a son of the resident herd sire, Varilek Consensus 1087 56. This calving ease bull had a 74 pound birth weight and a weaning weight of 652 pounds. His mother was a daughter of BCC Bushwacker 41-93. Repeat buyer Bob Tenold, Reva, South Dakota, chose Lot 41 at $7,000. He was sired by Tokach Upward 0113 and had EPDs of BW 3.8, WW 59, YW 107, and MILK 29. Allen Birkeland, Warnick, North Dakota, purchased Lot 9 at $7,000. This was a very good day for the Urlacher family. Watch as this young herd and family develop.